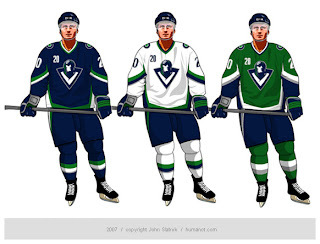 Last week, I posted some fan-made designs for the Vancouver Canucks' new logo and uniforms. We've heard that they're going to be unveiling a new logo this summer so everyone's wondering how it will look. So here are some more. These way-too-cool designs come from John Slabyk, he of Blue & Gold Project fame. He's a graphic designer who was implored by fans to take his artwork to Larry Quinn with the Buffalo Sabres. They liked his work a lot but a meeting with the team's GM yielded nothing. 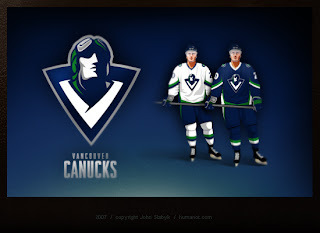 Not to be discouraged, he has come up with a potential new design for the Vancouver Canucks. And this is it. It's really cool but it's probably a little too high-quality for the NHL. The design is really clean and even incorporates the classic stick-in-rink logo of the 1970s while sticking with those traditional colors. So far, responses I've read to the design are mixed, though. I think the gist is that a lot of people like it but aren't naïve enough to think the design would actually ever been worn by the team. Personally, I'm not giving up hope on the Canucks or the NHL. Anything is possible and one day soon I hope to see them donning a logo that doesn't feature a whale more prominently than, well, a Canuck.